Obituary – Edgar, Robert James « Perry High School Alumni Association, Inc.
Robert J. 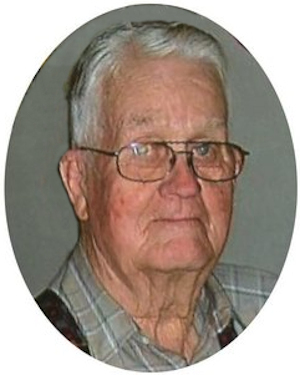 Bob Edgar, 83, of Perry, Oklahoma, was the son of Joseph James and Edith Florence Thompson Edgar. He was born September 22, 1929 in Lucien, Oklahoma and died Thursday, March 7, 2013 at Green Valley Nursing Home in Perry, Oklahoma. He was a graduate of Perry High School class of 1949. Robert served his country in the United States Army, Company I and after serving a tour in the Korean War he was discharged in 1951 with an honorable discharge. He married his sweetheart, Betty Lee Jerome, on November 11, 1954 in at the First Presbyterian Church in Perry, Oklahoma. She preceded him in death on November 27, 2011. They were married fifty seven years. Robert enjoyed fishing, gardening, dominoes, walking, and pitch club. But most of all he enjoyed spending time with his family and friends. He retired from the Department of Transportation as an equipment operator. Robert was a member of the Elks Lodge and VFW. Funeral services will be 2:00 p.m., Monday, March 11, 2013 at the Brown-Dugger Funeral Home Chapel in Perry, Oklahoma. Rev. Deborah Meinke will officiate. Interment will be in Lawnview Cemetery, rural Orlando, Oklahoma. Services are under the direction of Brown-Dugger Funeral Home in Perry, Oklahoma. Memorials may be made to the First Presbyterian Church of Perry or the Company I Foundation in care of Brown-Dugger Funeral Home, 1010 N. 7th Perry, Oklahoma 73077. Bob is survived by his daughter, Jacquetta Daniels Johnson and her husband, David of Cypress, Texas his son, James Jim Robert Edgar and his wife, Crystal of Perry, Oklahoma his brother, Tommy Edgar and his wife Karen of Kingfisher, Oklahoma four grandchildren, Christina Johnson Fulks and her husband, Russell of Hannover, Germany, David J. Johnson and his wife, Betty of Frisco, Texas, Leslie Hagelberg and her husband, Terry of Tulsa, Oklahoma, Jason R. Edgar and his wife Amy of Winchester, West Virginia one stepgrandson, Clayton Shaw and his wife Ashley of Perry, Oklahoma, seven great grandchildren, one step great granddaughter. He is preceded in death by his wife, Betty his parents, Joseph and Edith one brother, Vernon Edgar three sisters, Irene Lantz, Joan Rieman, and Margaret Edgar.